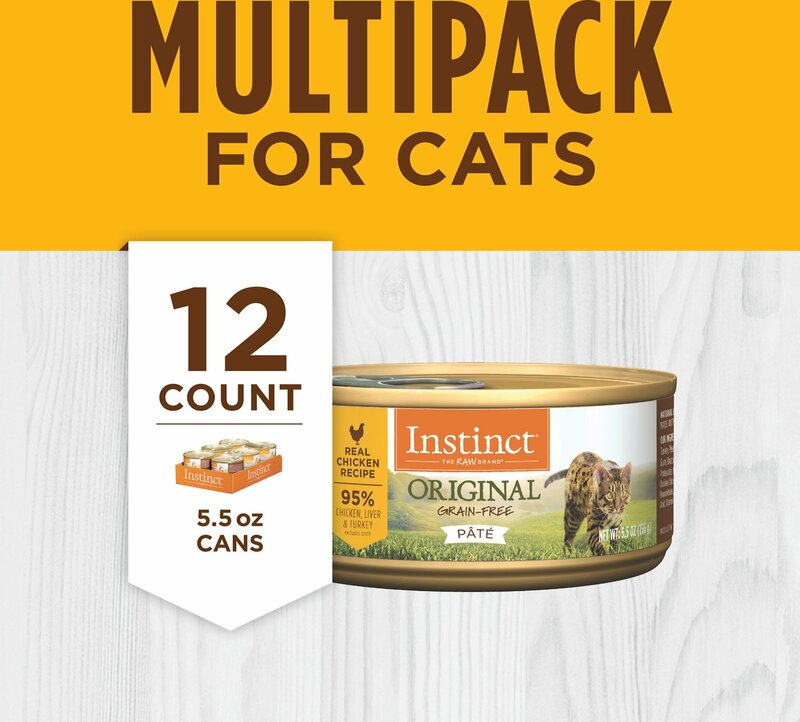 Satisfy your feline friend’s need for real food with Instinct by Nature's Variety Original Grain-Free Real Chicken Recipe Natural Wet Canned Cat Food. 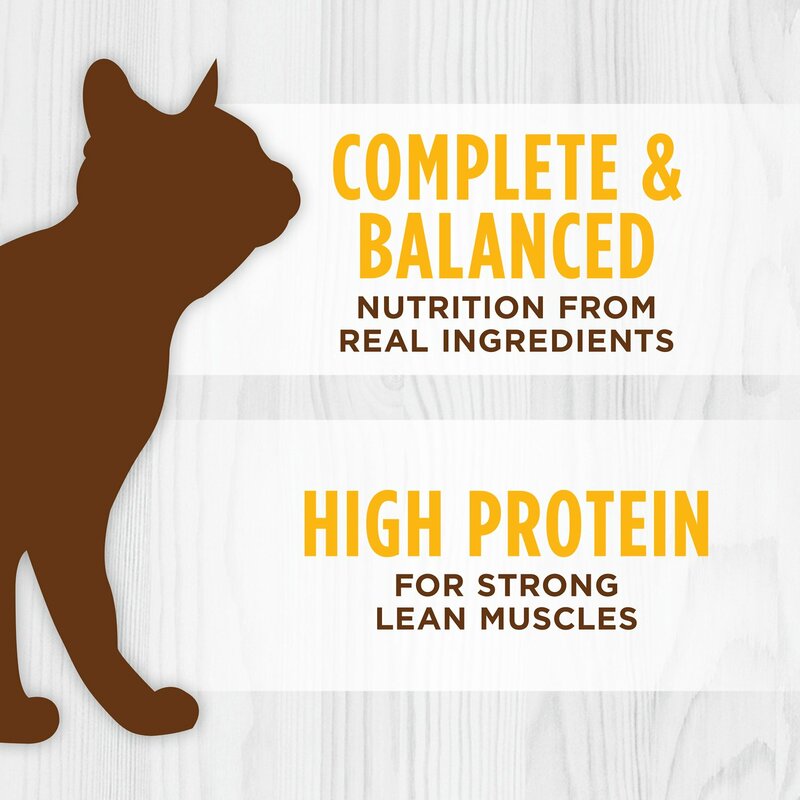 This high animal protein, grain-free recipe is guided by Instinct’s belief in raw, and made especially for your cat to unlock his potential to thrive. It’s thoughtfully balanced with wholesome foods including real meat, fruits and vegetables in a delicious pate texture, along with natural sources of omega fatty acids to help promote a shiny coat and healthy skin. Cage-free chicken is the first ingredient in this savory recipe that’s packed with animal protein for strong, lean muscles. 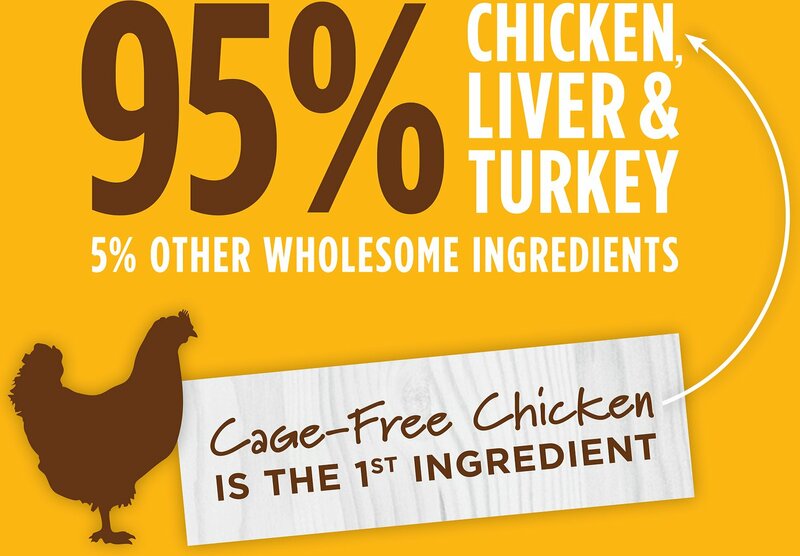 Made with 95% chicken, turkey and chicken liver; 5% vegetables, fruits and other wholesome ingredients; and 0% grain. 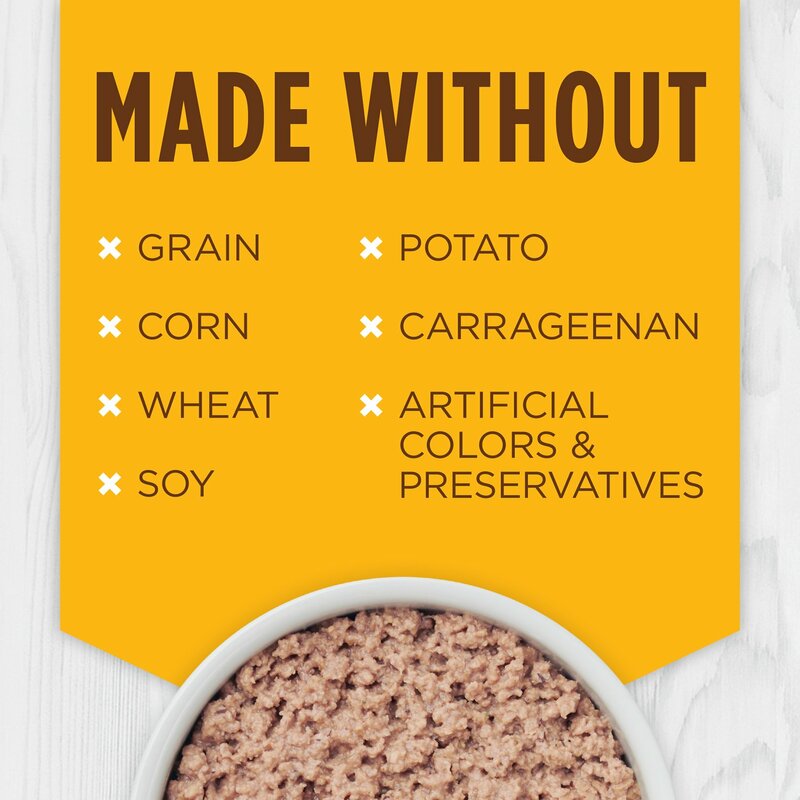 Contains no grain, potato, corn, wheat, soy, by-product meal, artificial colors or preservatives. Delicious pate also includes natural omega fatty acids to promote healthy skin and coat. Chicken, Turkey, Chicken Liver, Chicken Broth, Ground Flaxseed, Montmorillonite Clay, Egg Product, Peas, Carrots, Potassium Chloride, Salt, Minerals (Iron Proteinate, Zinc Proteinate, Copper Proteinate, Manganese Proteinate, Sodium Selenite, Potassium Iodide), Choline Chloride, Vitamins (Vitamin E Supplement, Thiamine Mononitrate, Niacin Supplement, D-Calcium Pantothenate, Pyridoxine Hydrochloride, Riboflavin Supplement, Vitamin A Supplement, Biotin, Vitamin D3 Supplement, Vitamin B12 Supplement, Folic Acid), Taurine, L-Ascorbyl-2-Polyphosphate, Menhaden Fish Oil (Preserved With Mixed Tocopherols), Artichokes, Cranberries, Pumpkin, Tomato, Blueberries, Broccoli, Cabbage, Kale, Parsley. Adults: Feed 2, 3-oz cans or feed 1, 5.5-oz can per 6 to 8 lbs of body weight per day. 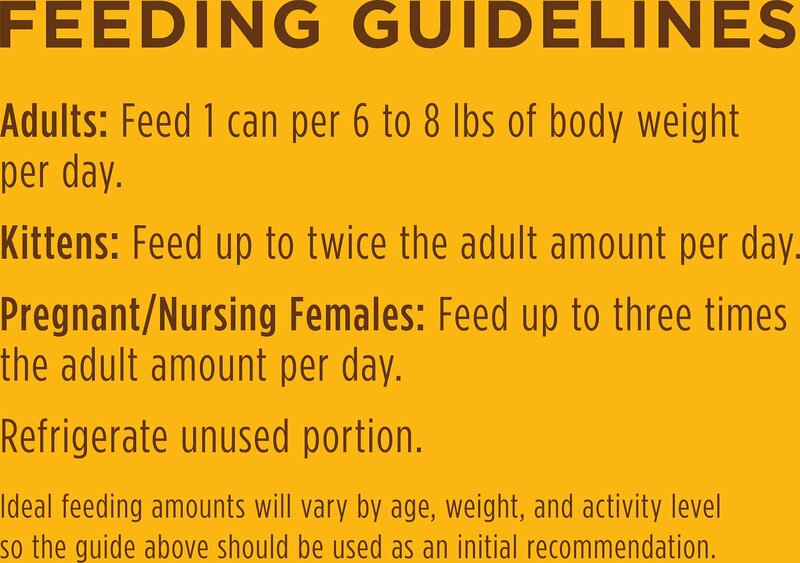 Kittens: Feed up to twice the adult amount per day. Pregnant/Nursing Females: Feed up to three times the adult amount per day. My mature picky eaters always come running when a can top pops, but then they either sniff and walk away or the take a couple of licks and they're done. Permanently. Until now. In desperation, I picked up some samples of Instinct (and a couple of other brands) and tried the girls on them. This one - Instinct Original Real Chicken - got a 9.7. They like the salmon best, and this just slightly behind it. They will eat Instinct but none of the other brands. They love this and are finally eating more than they have been. They love it and I do, too. Sassy is 15 and very picky. She also has hyperthyroidism, but will starve herself if she doesn’t like her food. Petsmart discontinued her preferred food . I usually go through at least three or four brands before we find one that she will eat. This one... first try! In addition, Routine cat throw up has all but become a rare occurance. Great so far after 2 weeks. Cats love it. Wet food is new for us. Until now we have always had adopted outdoor cats who would only eat kibble. This is the best I've been able to find and afford. We started with chicken and added salmon after a week. The cats love it. They look fantastic and have lots of energy. No litter box issues. 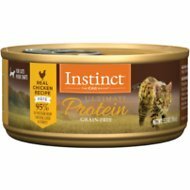 We are pairing this with Instinct's UP kibble so the cats can eat when we are not around, but they eat far less kibble than before (they were only eating kibble when we adopted them). Strong smell; be prepared. 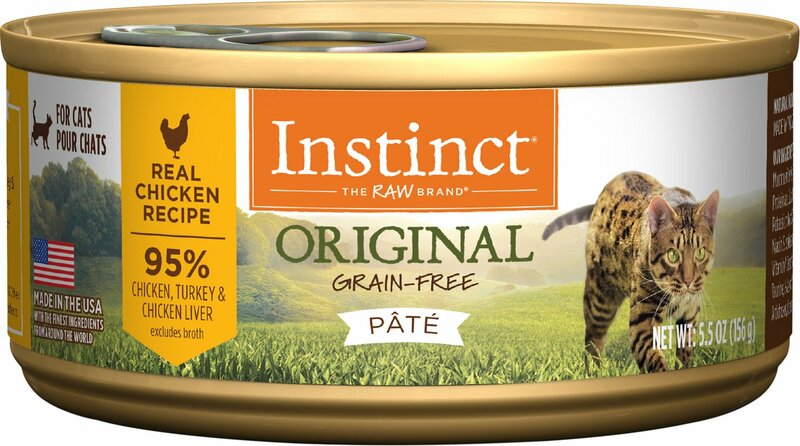 The Instinct Original canned cat food looks and smells good enough for human consumption! The food is juicy and moist without being watery or gravy-like--all food. My cats are loving it (as well as the Kitten version for my 7 mo old.) They had no problem transitioning from another brand. My cat is highly allergic and breaks out, so I thought I would try this. So far so good! I'll give it a little more time and if this doesn't work I'll try a more limited ingredient food. Thanks chewy.com for all your help! Unfortunately, not for my cats. I have six cats that will not eat this food. It's supposed to be very good and since it's pretty pricey, I figured it would be good for them. This was my first buy of this brand. I was disappointed, but I will keep trying. I will change the March order in plenty of time. This food is pure liquid slop. It is disgusting. One of my cats love it. One cat who eats anything won't touch it. Don't waste your money.